We all have read Ramayana or at least know the contents of Ramayana. We have heard the story of Ram Setu, the bridge made by Shri Ram's vaanar sena from Rameshwaram to Sri Lanka. This is story of Tareta Yug, more than 17,00,000 years back. Faced with the dilemma of how to cross the ocean, Rama performs a penance tapasya, fasting and meditating in perfect dhyana for three days and three nights to sagara, the Lord of Oceans. The ocean god does not respond out of arrogance , and Rama on the fourth morning,pointed the brahmastra towards the ocean . 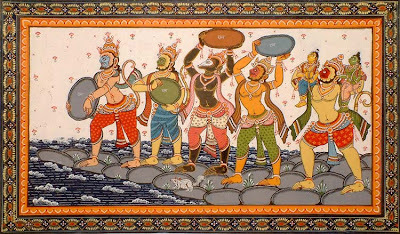 The Vanaras are dazzled and fearful at witnessing the enraged Rama demolish the oceans, and Lakshmana prays to calm Rama's mind. 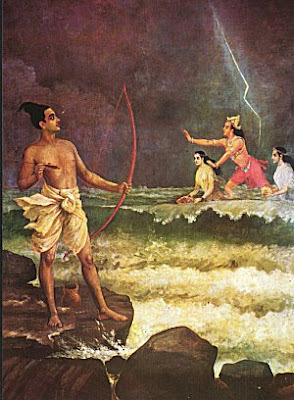 Just as Rama invokes the brahmastra, considered the most powerful weapon capable of destroying all creation, Saagara arises out of the oceans.He bows to Rama, and begs for pardon. Since lord Rama had to use the weapon , he suggests Rama re-direct the weapon at a demonic race that lives in the heart of the ocean. Rama's arrows destroys the demons, and establishes a purer, liberated environment there. Saagara promises that he would keep the oceans still for all of Rama's army to pass, and Nala constructs a bridge (Rama's Bridge) across to Lanka. Rama justifies his angry assault on the oceans as he followed the correct process of petitioning and worshipping Saagara, but obtaining the result by force for the greater good. In another version of the story, Lord Rama redirected his missile to the barren Island, and as a result huge volcanic eruption resulted. This volcano is the one which is found till today at the southern part of Indian peninsula . Now 'they' call this mythology, which may or may not have occurred. Amazingly NASA released these images taken from satellite, showing a man made bridge in between India and Sri Lanka. NASA named that bridge as Adam's Bridge and declared that bridge is made of chain of limestone shoals, and about 30 km long. The age of this bridge is estimated around 17,25,000 years old. As this was an issue related to poor Hindu mythology the issue went unnoticed from the media (which is always busy in other important news like the marriage of Liz and Nayaar) and the worthy Indian public. But hold on a second, this is not the real reason of the cry. The great Government of India is very keen for saving the hard earned money of Indians and world population. They have come up with a project named Sethusamudram, in which they have decided to destroy Ram Setu envisages cutting a ship canal across Rameshwaram near Kothandaramaswamy temple to connect the Gulf of Mannar in the Palk Bay because it will help India save about 400 nautical miles of sailing for ships, about 20 tonnes of fuel per transit or Rs 70,000 per vessel, foreign exchange of Rs 21,000 crore per year and voyage time of about 16 hours per transit per vessel. Now people all over India are crying before the Indian government for not to hurt their sentiments and alter this project. Not only that a team of related engineers has suggested an alternate route utilizing the 15 km barren uncultivable land strip that stretches East-West between Pamban and Dhanushkoti which will save the Ram Setu as well as the motive of Sethusamudram project. But till now nothing has happened. Why was the route of Metro passing 'close' Qutub Minar in New Delhi was abandoned and later reworked fearing prospective damages to this 815 years man made monument? Why the project of Taj corridor (which would have made lot of dollars to our money minded govt) was put off after the hue and cry of environmentalists as the construction near Taj 'may' cause bad effect on this 359 years old man made monument. Please give attention here that these monuments were not going to be destroyed but were 'feared' to get damaged. Will any government in China would destroy or even alter The great wall of China(2695 years old) for the sake of any amount of money? Will any one allow pulling down 4507 years old Pyramids of Egypt in lieu of any uncountable amount of money? 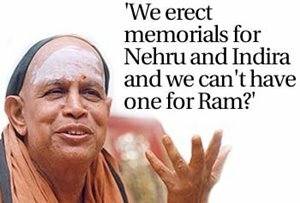 If the answer is NO, then why this 17,25,000 years old man made monument is being destroyed for the sake of some coins? As our 'secular' government see Hindu organizations behind this Ram setu, let's for a moment leave the Ramayan part, then isn't the age of this bridge is sufficient for its protection as world heritage? (And there are thousands of cheaper ways to save crores of Rupees if the Indian Government is really so worried of saving bucks. (We all remember the petty tea bills of Lakhs of Rupees per month per MP, stop such expenses and save Crores PER DAY). Morover, lakhs of Indian people have signed a petition to the President of India for protecting Ram Setu, but not even a single stone has moved so far, in spite I have heard that exercises of destroying the bridge have already started. 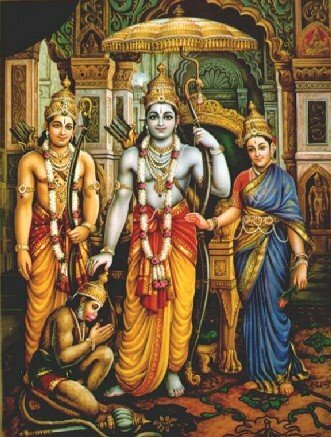 Ramayan has taught us the great way of leading respectable life and today on the month of Shri Ram Navami, a chopayee of Ramayan is the need of hour for us people to understand and adopt. This would be our true celebration of this auspicious day.